As most states try to figure out how to lure self-driving car development inside their borders, Colorado is several steps ahead. 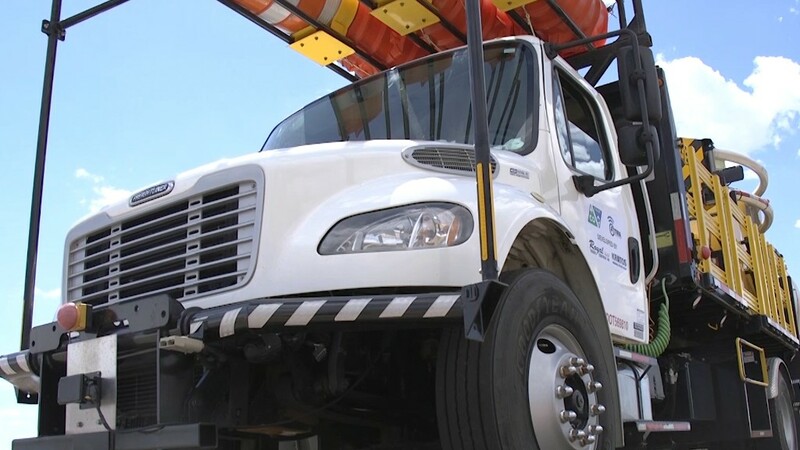 This fall the state will deploy a fully autonomous truck to help its road crews. 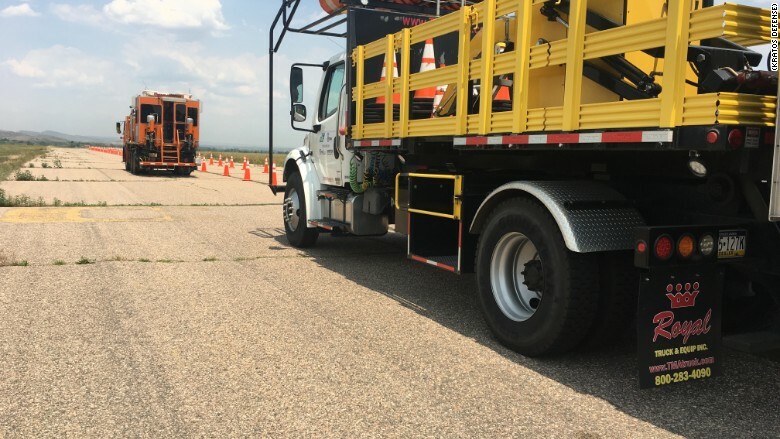 The Colorado Department of Transportation will use the "crash truck" to shadow road crews, and act as a shield to protect workers from being struck by speeding vehicles. It's one of the earliest meaningful deployments of self-driving technology in the United States. Crash trucks are a staple on U.S. highways. One unlucky worker is tasked with driving the crash truck behind a road crew that may be mowing, painting lines or performing other maintenance. The job is dangerous given the risks of being at the wheel of a slow-moving truck that may be crashed into by vehicles moving at 75 mph. In Colorado, there were 21,898 crashes and 171 fatalities in work zones between 2000 and 2014. "People talk about automation and will this displace workers. 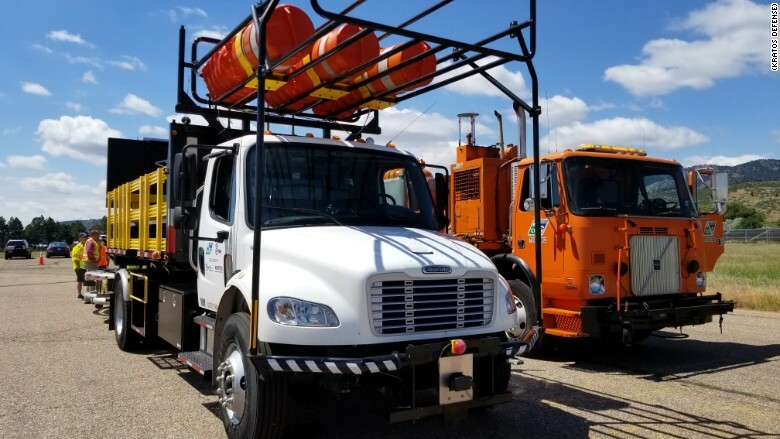 Here's a case where I think everyone will agree we want to get workers out of these trucks," said Shailen Bhatt, the executive director of the Colorado Department of Transportation. The autonomous crash truck, left, shdaows the vehicle ahead of it. Road crews have long relied on crash trucks because it's far safer for a hulking truck to be hit than an unprotected worker standing on the road. The trucks are designed to take a beating, and have a large honeycomb bumper for absorption. But now Colorado has found a way to keep road crews safe, without risking a human life in the crash truck. The self-driving truck mirrors the movements of a vehicle ahead of it. The lead vehicle transmits its location and path to the self-driving truck via radio waves. Kratos Defense, which makes autonomous vehicles for the U.S. Army, supplied the self-driving technology for the truck. The Kratos system is designed to be retrofitted on any existing crash truck. Actuators are attached to the trucks' steering wheel and pedals to control them. Colorado's new self-driving truck will allow the state to keep a driver out of harm's way. A crash truck usually costs roughly $150,000, according to Bhatt. This self-driving truck cost the state about $300,000. Colorado's government has a track record of welcoming autonomous vehicles. In October, it allowed a self-driving Budweiser truck to make a delivery. This deployment of self-driving technology is far more advanced. The beer truck was shadowed by a convoy of protective vehicles, and made only one trip. Colorado's new automated trash truck will be on its own, and working frequently. Bhatt said former drivers of crash trucks will be given other duties. If the initial deployment of the truck goes smoothly, the state will purchase more of the vehicles. So far its trials of the vehicle have gone well, according to Bhatt.